How to add years, months, weeks and days in given date in Java? 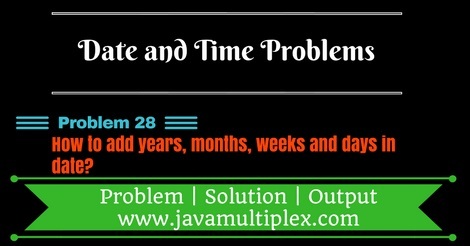 Home Date Interview Questions Difficult Date Questions How to add years, months, weeks and days in given date in Java? 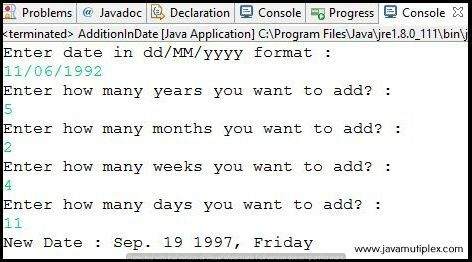 Write a program in Java that adds number of years, months, weeks and days in given date. We are using add() method of Calendar class that is present in java.util. * package and accepts Calendar constants YEAR, MONTH, DAY_OF_WEEK_IN_MONTH and DAY_OF_MONTH for the addition of years, month, weeks and days respectively. How to check whether given date is valid or not? How to convert String to Date? // Creating Calendar class instance. // Adding years to Calendar date. // Adding months to Calendar date. // Adding weeks to Calendar date. // Adding days to Calendar date. Output - How to add years, months, week and days to given date ? Note : You can validate your result using date calculator. Tags : Date and Time problems, Date addition in Java, Solution in Java, String, DateFormat, SimpleDateFormat, Regular expressions, if else statement, Calendar.